This view of the intersection of Monroe Center and Division St. looks slightly toward the Northwest. On the far right, at the corner is the Peck Building, formerly Peck's Drug Store. At the foot of Monroe center is the Amway Grand Plaza Hotel, formerly the Pantlind Hotel. 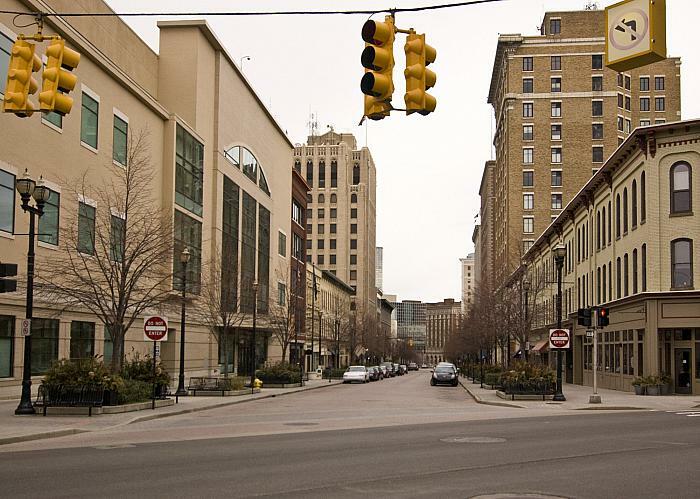 The tall building at the center, on the left side of the street, was the Michigan National Bank Building; on the right, the tall building just beyond the Peck Building was originally a bank building. At the far left is the the Grand Rapids Police Dept.